This support article illustrates how a host starts and leads a Secure Webinar, as well as how the host and panelists can moderate the webinar. Although the screencaps below assume that you are on a desktop/laptop, you can host a webinar from any supported device. 1. At the time of the webinar, click on the "Start Secure Webinar" button on your dashboard. You can start the webinar up to 10 minutes early from the original scheduled time. 2. Once the webinar has been started, any attendees that have already been waiting will be joined and see your video feed. 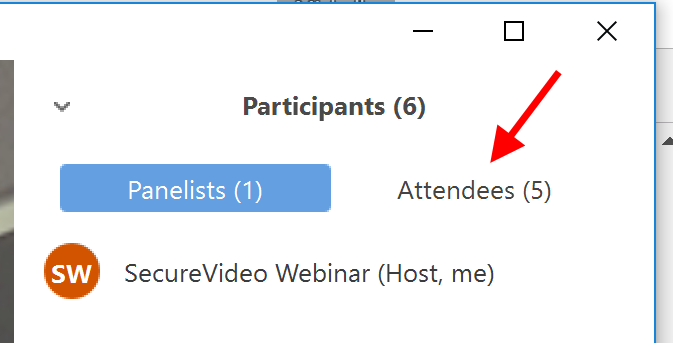 By default, only panelists can see how many attendees are actively on the webinar (viewable from the bottom panel). If you do not see the panel, click anywhere on the video window, and it will appear. This number shows the total number of attendees on the call, including yourself. 1. When at least 1 question has been submitted, but not yet answered, a number will appear above the Q&A icon, in a red circle. The number denotes how many unanswered questions there are. Un-answered questions are only visible to panelists. 1a. By default, questions can be submitted anonymously. 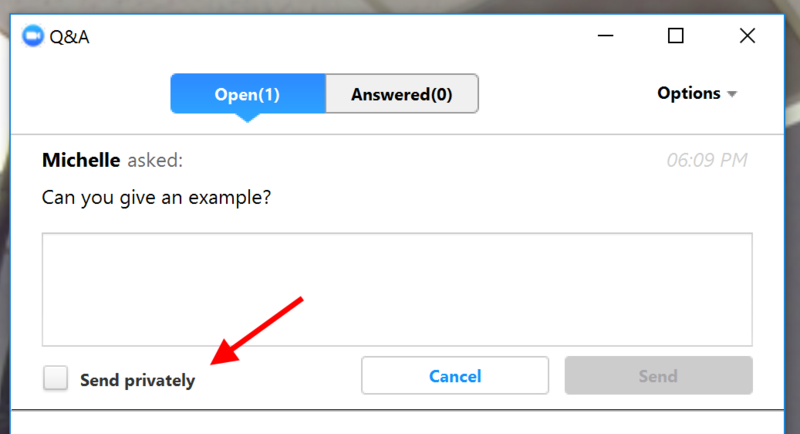 To disable anonymous questions, click on "Q&A", and uncheck the setting from the "Options" dropdown. 2. Unless the question was submitted anonymously, the name of the participant will appear before the question. Click the "Answer Live" button if you answer the question by speaking through the webinar, which will move the question to the "Answered" section, and make it visible to other attendees. Click the "Answer by Text" button to reply by text. 2a. If responding by text, you have the option to "Send privately" (i.e., send only to the person who asked the question), or to make your response (and the question) visible to all attendees. 1. Click on the "Chat" icon. 2. A chat window will appear to the right of your streaming video. You can send a chat message to either all panelists only, or to all attendees (including panelists). 3. 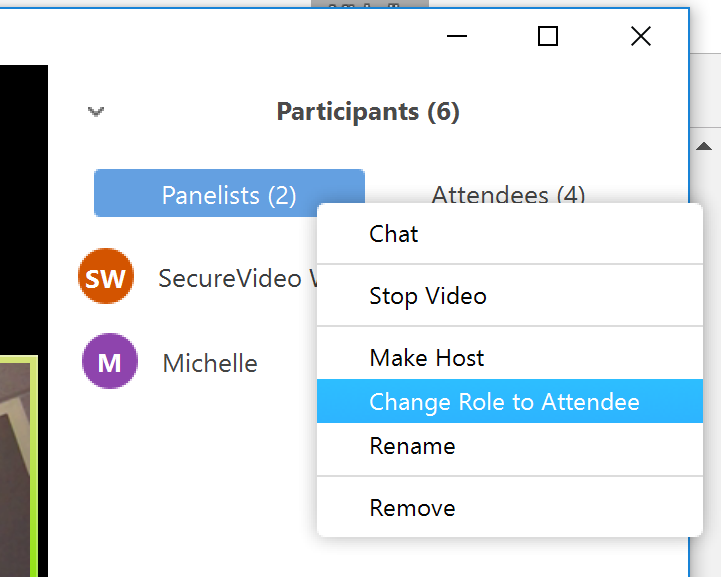 By default, all attendees can send a chat to panelists, but not to other attendees. To change this setting, click the "More" drop-down to make a different selection. 1. Click on the "Participants" icon. 2. A panel will appear on the right. Click on the "Attendees" tab. 3. 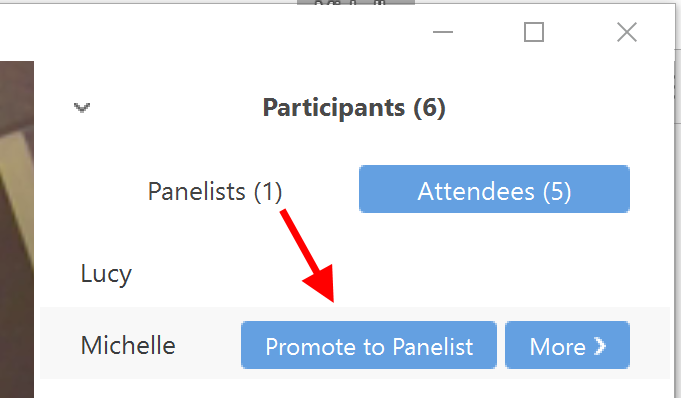 Hover your mouse cursor over the name of the attendee that you would like to convert to a panelist, and click on the button that appears: "Promote to Panelist". 2. A panel will appear on the right. 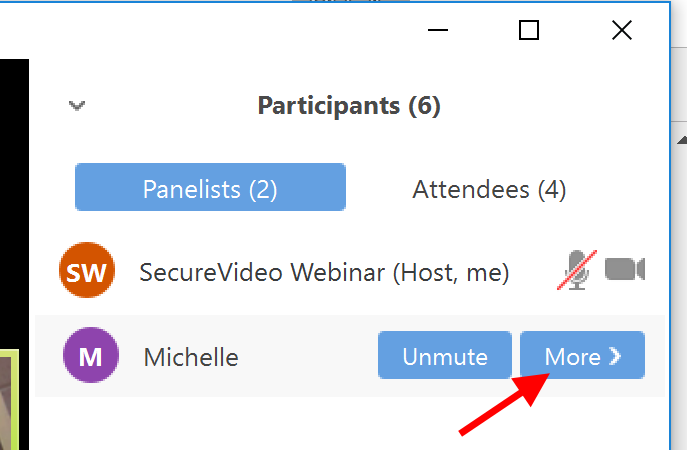 Hover your mouse cursor over the name of the panelist you would like to remove, and click on the "More" button that appears. 3. In the menu that appears, select "Change Role to Attendee". Or, one of the other options. Chat: send a private chat just to that panelist. Make Host: make this panelist the host of the webinar. They will be able to manage/create/remove panelists (but you will lose that ability to do so). Rename: change the name that the panelist appears under.